The Eskimo Nebula is a planetary nebula - a shell of gas that is ejected from a star towards the end of its life. 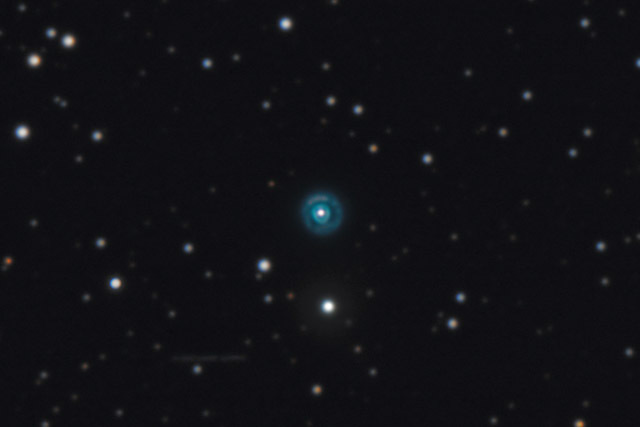 The Eskimo Nebula ejected its shell less than 10,000 years ago. Visually, the nebula is quite small - only about 48 seconds across. As such, it is a challenging photographic object. Also shown in this image is a trail made by magnitude 15.0 asteroid #3063 Makhaon. Asteroids are rocky "minor planets" most commonly found in the asteroid belt between Mars and Jupiter. In this image, North is Down. This image is cropped to 30% of the original full frame. Software Used Images Plus 4.5 for camera control, Images Plus 4.0 for calibration, stacking, digital development, and multiresolution smoothing. Photoshop CS5 used for flat fielding, levels and curves, color balance, high pass filter, star shrinking, saturation adjustments, noise reduction, and compositing. Carboni Tools for additional saturation adjustments and noise reduction. Notes The Eskimo Nebula is difficult to photograph well, because it is small and the level of detail one is trying to capture is quite fine. Unfortunately, the atmospheric seeing (the shimmering in the layers of air surrounding Earth) was pretty poor on both the nights I photographed this object. As such, the level of detail and sharpness is not very good with this image. This image is a composite image from 2 nights. For the background stars, outer nebulosity of the Eskimo and the asteroid, I used 3 minute exposures at a high ISO of 1600 (high sensitivity). For the main portion of the Eskimo, I used 90 second exposure at a low ISO of 200. This allowed me to capture the best range of brightness in the bright portions of the Eskimo.